The impetus for this modest booklet was fuelled by a mention of Grimsby Beam Station (Tetney) in the book "Spycatcher" by Peter Wright, which was effectively banned by the British Government. Peter Wright is very insistent that the Beam Station was an exceptionally important landmark in the development of a world-wide communications system. This interested and excited me but I found it rather difficult to believe that the modest buildings of the Beam Station could have been the site of such important work and if it was, why didn’t local people know more about it? I decided to investigate further and I leave you to draw your own conclusions. I have addressed the booklet to the general reader rather than those who have a technical background or interest but in the course of my research I have amassed a considerable amount of information, both technical and general, and a collection of photographs. These are available at Tetney County Primary School for anyone who would like to consult them. (N.B. now in Grimsby Central Library). Thanks are due to GEC- Marconi, B.T. .Cable & Wireless Ltd and many individuals too numerous to mention. TETNEY BEAM STATION - WHAT WAS IT? Although the book "Spycatcher" is about the intelligence service its mention of the Beam Station is not connected with spying or any type of intelligence work but because of the technical advances that it represented. When it was opened the Beam Station was the most advanced long-distance communication system available. In modern terminology it was "state of the art". 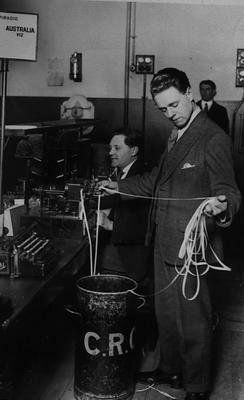 Before the First World War Britain had long considered changing the cable method of communication with the Empire to a radio system. The idea had first been suggested in 1906, but there was considerable disagreement about the idea and it was not until seven years later that a contract was signed with Marconi. Fortunately or unfortunately the war and additional political disagreements delayed the scheme until 1924. By this time work by Marconi had led to experiments with short-wave radio which he concluded was much more promising than the long-wave system which had been the original idea. According to "Spycatcher" Marconi offered to build, free of charge, any link across the world, providing the government would suspend development of the long-wave stations until Marconi’s short-wave beam system had passed its trials. The government agreed and asked for a link between Grimsby and Sydney. According to the same source the specifications were "awesome" and it astonished "the rest of the communications industry". What does seem certain is that the announcement by Marconi that short-wave communication seemed to be more promising threw the government into disarray. The great advantages of the new system were that smaller aerials and reflectors could be used and much less power was needed to achieve the same results. 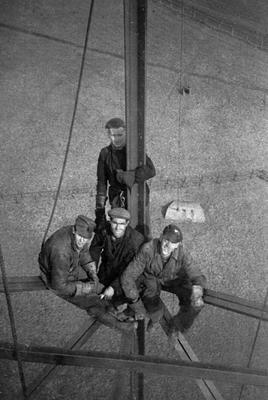 According to "Girdle Round the Earth"-" the capital cost of beam stations was a tenth of that of cable and the operating costs lower too. "Agreement by the governments of Canada, South Africa, Australia and India to adopt the system put considerable pressure on the British government who agreed to the adoption of what was known as the Beam System. This was the beginning of the Imperial Wireless Chain - a revolution in world-wide communication. According to "The History of the Marconi Company" the agreement with the company was "that as the contractor, it should build an initial beam station for communication wih Canada. If this proved successful, the system could be extended to communicate with South Africa, India and Australia". Although "Spycatcher" emphasises the Grimsby - Sydney link, the first station was in fact the Canadian Beam which was opened at midnight 5/6th October 1926. The other stations followed very shortly with Tetney establishing communication with Australia at 6 a.m. on 8th April 1927 and India at midnight 5/6th September of the same year. In actual fact it seems that the link was not between Grimsby and Sydney. The transmitting station in Australia was at Ballan, near Ballarat, Victoria about 50 miles N.W. of Melbourne and the receiving station was at Rockbank near Sydenham, 15 miles from Melbourne. Certainly the link between Australia and Grimsby seems more impressive than the Canadian link because of the greater distances involved. "Wireless World" of March 30th 1927 emphasises the importance of the station at Tetney when it reported the official trials. It stated "The Beam System has thus proved itself over the longest distance that any telegraph service can be called upon to cover". According to The Times "The invention of the wireless beam system has revolutionised overseas communication and made possible the use of telegraphic communication as an everyday necessity rather than a luxury." Both these facts indicate the significance of the Tetney Station which ensures it a place in the history of international communication. All the stations were extremely successful. For example the Australian Government had been guaranteed an average traffic capacity of 20,000 words per day. In practice the capacity proved to be over three times this amount. In a single week in December 1927 the total number of words carried by all the beam stations was at a rate which would total 34,840,000 words per year. Marconi’s great ambition to provide a world-wide system of wireless communication was realised. The Beam Station must have had a considerable impact on the surrounding area. There were eight masts and various buildings. In the main the buildings are still there at the time of writing (1993). The three masts on the Grimsby side of the buildings carried th Australian aerials and were 275 feet tall. The five masts on the Tetney side carried the Indian traffic and were 285 feet tall. All the masts had cross arms at the top and these were 90 feet in length. To imagine the size of the masts it may help to know that the Grimsby Dock Tower is just over 300 feet tall. The masts were supported by stays which were anchored in concrete blocks 14 feet deep. Not surprisingly these blocks still survive either as obstacles to be worked around in the fields or in the squares of trees which have been planted to hide them. Apparently an attempt was made to move the blocks but to no avail. The distance between each mast was 650 feet and the distance between the first and last was approximately one mile. The aerials themselves looked like curtains of vertical wires hanging from the triatic bearers between the cross-arms at the tops of the masts. Each wire was attached at the lower end to a balance weight arm which kept the wire in tension. The lower end of each pair of aerial wires was connected to a special box and these in turn were connected by a system of copper pipes or feeder tubes to the particular transmitter. 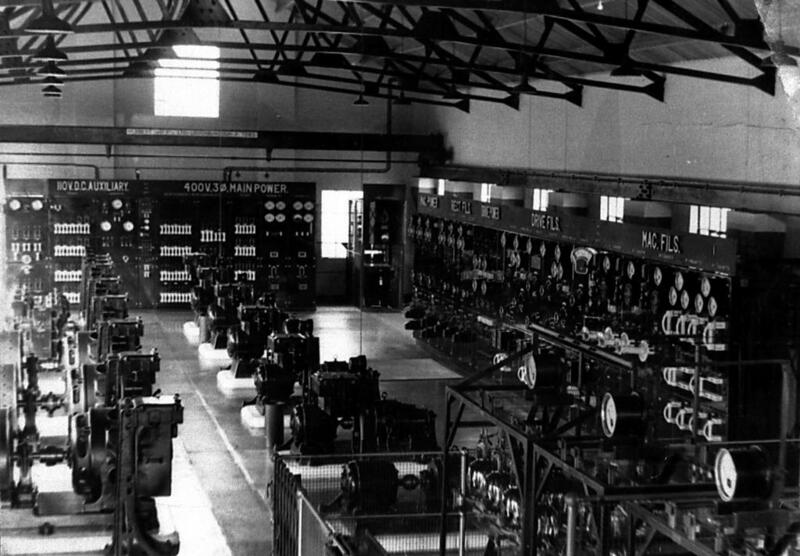 The largest building was the machinery hall and the transmitting room was behind this. The grounds of the station were by all accounts kept in immaculate condition and sported lawns, a rose garden and a fish pond. The fish pond was the idea of Mr. Jupe the Chief Engineer but the fish disappeared shortly after the construction of the pond. Apparently they were the victims of a hungry heron. Travellers who passed the station at night would have seen the glow from the large valves shining through the windows and the ruby lights on the masts to warn low flying aircraft. All in all the station must have been a prominent landmark and made quite an impression on the surroundings until it was finally dismantled in 1940 leaving only the buildings, some concrete blocks and squares of trees to remind us of its previous existence. The beam stations worked in pairs - one transmitting and the other receiving. 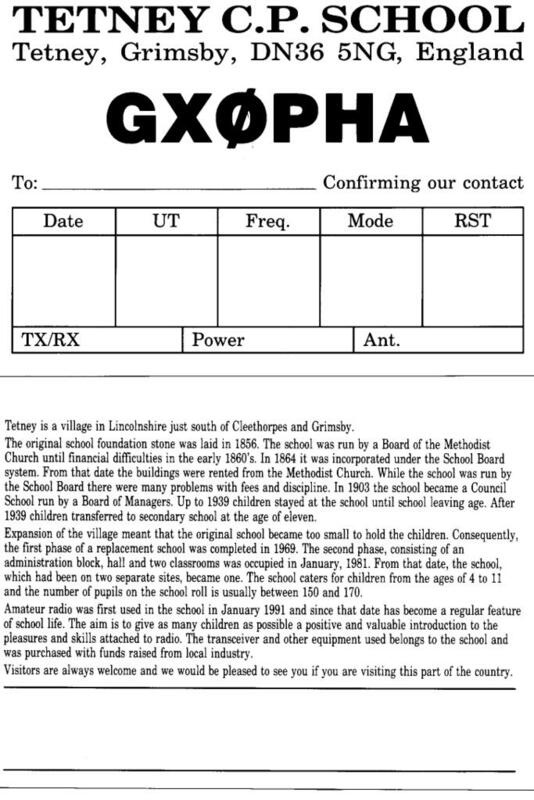 As mentioned previously Tetney transmitted directly to Sydenham near Melbourne in Australia and India. The Indian receiving station was at Dhond about 50 miles east of Poona and the Poona transmitter was at Kirkee about 75 miles south east of Bombay. Messages from Australia and India were received at Winthorpe which is just north of Skegness. The other pairs of beam stations, with the transmitting station first were Ongar and Brentwood; Dorchester and Somerton; and Bodmin and Bridgewater. The system worked in the following way:- if someone wanted to send a telegram from a town in England to another in Australia the message was written out and handed in at the Post Office. It was marked "Via Imperial" and telegraphed to the central telegraph office in London. There the written message was changed into dots and dashes and punched onto a paper tape. This was then put into a transmitting machine which usually operated at 150 words per minute. These signals were sent along land lines to Tetney. These lines were laid alongside the railway from London to Holton-le-Clay Station and then to the Beam Station. At the Beam Station they passed through a series of valves to the aerials and were then transmitted to their destination. The messages travelled at the speed of light (approx, 3000,000 metres per second) so that to all intents and purposes the reception was simultaneous with the transmission. At the telegraph office they were converted back into words or figures and delivered as a telegram to the recipient. It is clear that this was an exceptionally important service and to ensure that there were no interruptions to it considerable precautions were taken. Almost all the vital equipment at the station was provided in triplicate and additional spares were kept close to hand. The power for the station was provided by the Grimsby Electricity Works at 6500 volts and the Beam Station was linked to the Scartho sub-station with the cables being laid alongside the A16 to Holton-le-Clay then under the railway crossing following the road to Tetney. At "The Grange" the line left the road and skirted the farm buildings until reaching the Beam Station. Certainly it was designed by the Marconi Company but at the time of writing further information is not available. We do know that the buildings at the Bodmin Station were constructed by the Foundation Company of London and that the masts were supplied and erected by The Armstrong Construction Company. The building of these stations must have been quite specialised work, therefore there is a likelihood that the same contractors were involved with all stations. Precise alignment of the masts was of vital importance and had to be carried out with great care. They had to be at right angles to the shortest great circle route to the destination. As compass bearings were insufficiently accurate, the installation engineers had to be instructed to take fixes from the sun or certain stars to provide the correct orientation. For transmission to Australia only one wavelength was used - 25.096 metres. Because this wave length is above 20 metres it travels better in the dark. As Australia is roughly half-way round the earth from Britain the beam was directed either eastwards or westwards according to which was the darkest side of the earth's surface. In practice this was west in the morning and east in the evening. The westward path covered approximately 12,000 nautical miles and the eastward path was 9,000 nautical miles. For transmission to India two wavelengths were used - 35 metres and 16 metres. Again one was used for short path communication and the other for long path. The call signs of the transmitter were GBH for Australia and GBI for India. The transmitter used approximately 20kW power as opposed to the lOOOkW required by a similar longwave station. His deputy from 1928 to 1939 was Mr. C.J. Henderson. 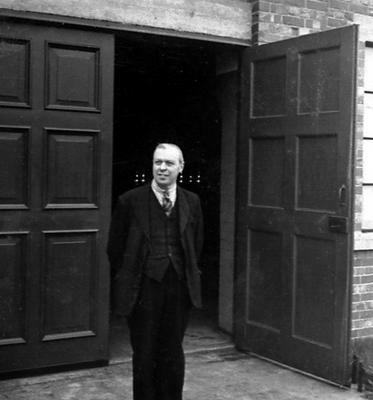 His daughter, Mrs G. Parrish is at the time of writing (1993) living in Humberston and has provided much information. Mr Henderson was unfortunately killed in a road accident in Salisbury, Rhodesia in 1965 when he was in charge of another station which he took over in 1940. There were 5 or 6 TA's (Technical Assistants) all non local people. The station had a Morris van with two drivers and this was used to ferry in the staff from the Grimsby area. Transport was essential as of course the station operated for 24 hours per day. There was an outside staff of 4 or 5. They were local people and included Mr Ladds, Walter Stocks, Mr Staves, Gil Robinson and Charlie Lingard. Other names quoted are Pacey and dark but it is not known what their positions were. Mr G. Bonner who lived in the Brambles, The Lanes, Tetney was the clerk who undertook all the administrative work. His daughter still lives in the village. Mrs Parrish recalls the visits of a number of students from India who in all probability were being trained for the Indian end of the operation. She also remembers university students who visited and in particular a Mr Milne. His visits were not connected with the technical aspects of the station itself but with monitoring insect life and Mrs Parrish remembers nets being placed at different heights on the masts and the insects found at different levels recorded. The large valves with their glow inside the station attracted many moths and other insects. All in all the Beam Station does not seem to have provided a large amount of employment for local people. The technical staff were often long-term employees of Cable & Wireless who had worked at other stations. As specialists in a relatively new technology who had moved around the country there was a certain camaraderie among them and they do not seem to have mixed a great deal. To a certain extent they were part of a small self-contained group who kept largely to themselves. 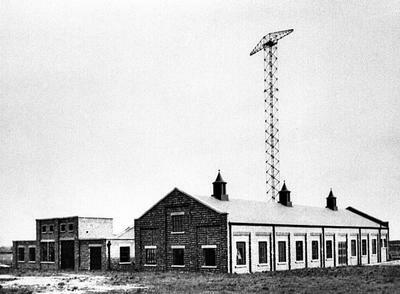 In 1940 the Beam Station was closed and the masts dismantled. A team of men, some local, some from further afield, started to take the masts down in the winter of 1939/40. The contractors for this work were F.E. Beaumont, Commercial and Ecclesiastical Steeplejacks from Streatham, London. The site foreman at that time was Thomas Sanaway Rodwell, who at the time of writing (1993) is living in retirement in Grimsby after a distinguished career with the BBC which was crowned by the award of the British Empire Medal for services to the communication industry. 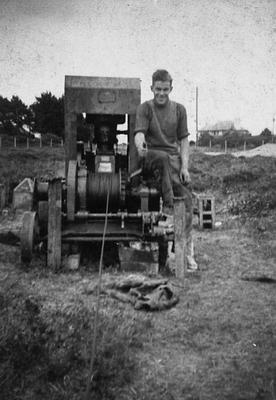 Another of the workers involved in dismantling the masts was a young Harry Woolf who had cbme from Essex to work on the site. Other men who worked on the site were Bob Jackson, Jimmy Flegg, C. Cuff, Tom Tye, Percy Greenfield and G. and J. Groves or Greaves. Tom Rodwell could not name others. In his own words "being over 50 years ago and being a little over 75 years old, some of my memories may not be 100 accurate as memories fade a little". Much of the detail about the dismantling has come from Thomas Rodwell or "Snowy" as he was known on the site and Harry Woolf. The Tetney masts were dismantled and re-assembled at Dorchester and Somerton, Somerset and used for communications during World War 2. The condition of the steelwork was as good as new and was all used again. The masts were transported by road on lorries and trailers belonging to Dennis & Co. of Epping Forest near London. The mast legs were on a lorry and the cross bracings on the trailer. Each mast needed three lorries and trailers to transport them. All the steelwork was loaded on the Tetney Road. The ground was too soft for the vehicles to go onto the field and the steelwork was moved across the field on wagons which were propelled by hand on a rail track. The southernmost mast (nearest the present school) was dismantled first. It was winter and at one time the snow was 18 inches deep. Working conditions were very difficult and the men only worked between three and five hours daily. It took two months to dismantle the first mast. The men were only paid for the hours worked. At that time this was between one shilling and four pence and two shillings and nine pence per hour according to the position held. 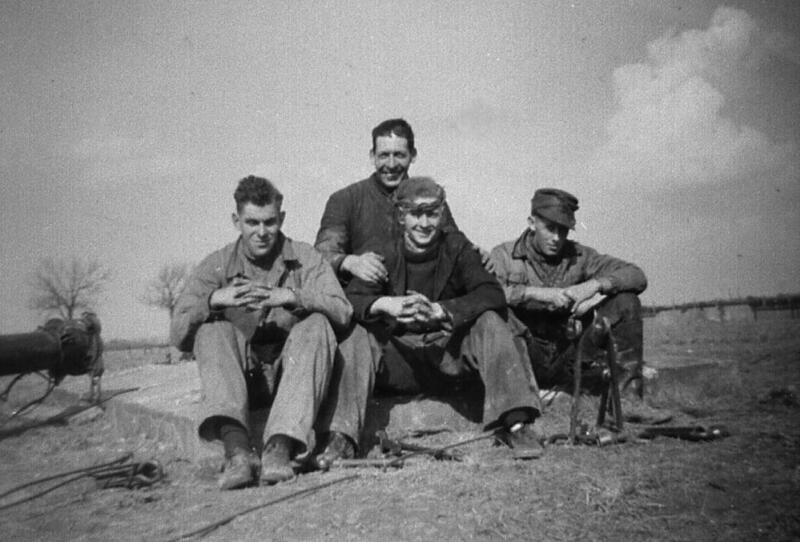 When the weather improved the men worked seven days a week - from 7 a.m. to 8.30 p.m. Monday to Friday, 7 a.m. to 5 p.m. on Saturday and 8 a.m. to 4 p.m. on Sunday. Harry Woolf remembers being paid one shilling and eight pence per hour and being guaranteed 65 hours per week. After the second tower was dismantled improved weather and experience of working with this type of mast led to the men agreeing to take the remaining six masts down at a price of £160 per mast. Each mast was then dismantled in 10 working days with a team of eight men. 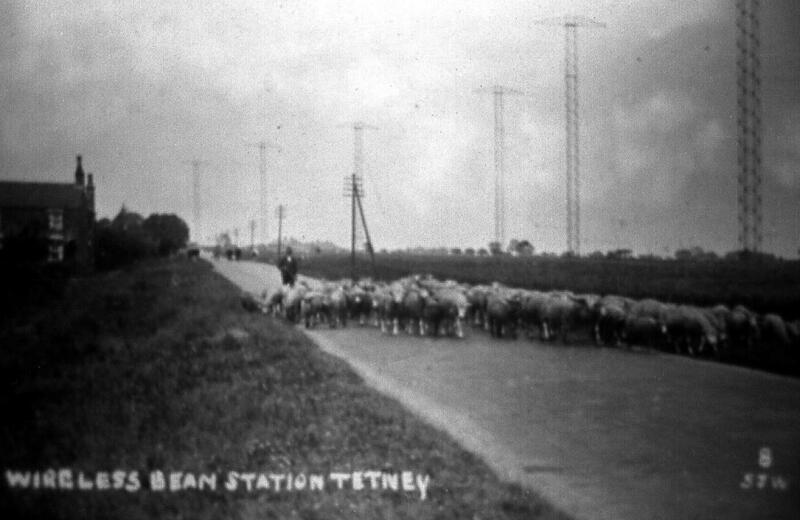 Tetney Beam Station disappeared from the skyline in around six months. Why did the station close? I have received a number of intriguing suggestions and leave the reader to draw their own conclusions. It may be helpful to consider the situation prior to the introduction of the beam service and follow the thread through to the closure of the station. In broad outline the situation was as follows. Prior to the construction of the beam stations the majority of the traffic was carried by cable but within months of the opening of the beam service it had captured a large proportion of the business. The cable operators began to feel the effects of the competition and revenue dropped quite substantially. For example, the beam service had taken 65 of Eastern Telegraph traffic and more than 50 of Pacific Cable traffic within six months. Dominion governments were also effected because they were subsidising the cable companies. The Post Office beam stations were turning out to be a major threat to cable interests. Cablegrams cost 6d at the ordinary word rate and 2 shillings for full rate while by beam radio the full rate was 4d. Action was required. A committee was set up under the chairmanship of Sir John Gilmour which led to The Imperial Wireless & Cable Conference at which the companies and governments were represented. The remit of the conference was to review the situation which had arisen and to make recommendations with a view to a common communications policy being adopted by the various governments. In 1928 a report was produced which recommended that the cable and wireless resources of the British Empire be merged into one system. As a result a new company was formed under the name "Imperial and International Communications Ltd." This name was changed in 1934 to Cable & Wireless Ltd. which is the name still used today. It was recommended that the company would have a revenue target of £1,865,000 and that it would lease the Post Office beam stations for £250,000 p.a. for 25 years until 1953. In September 1929 the beam stations were transferred to the new company which controlled not only Tetney Beam Station but 164,400 nautical miles of submarine cable, 13 cable ships, 253 cable and wireless stations and offices and a stock of new cable worth £824,000. Tetney was a key part of a very profitable side of the business. According to the 1928 report the beam services to Australia, South Africa and India yielded a very high profit. Unfortunately not everything worked to plan. In the 10 years following the agreement there were a number of pressures which made the targets difficult to attain. Among these were the growth of air mail services, competition from foreign wireless services and of course the world economic depression which squeezed the revenue. It became clear that in spite of re-organisation the company would not reach the financial targets. Another problem for the company was that the Post Office held the monopoly for wireless telephony(the spoken word) and this was clearly the next stage in the development of telecommunications. In April 1938 a new agreement was reached. Among the results was that the Post Office beam stations were conveyed to the company and this saved over £250,000 per annum. Other concessions were made. These were probably insufficient and therefore financial considerations may have played a part in the closure of the station. With war approaching there may well have been strategic considerations and the following suggestions have been made:- In war time the station would have been a very prominent landmark for enemy pilots. Due to the proximity of a number of airfields it may have been a danger to low-flying aircraft. It could have caused interference to the system of radar stations which stretched along the eastern side of Britain. The station at Stenigot being the nearest in the chain. Messages would have been vulnerable to interception by the enemy. The position of the station would have made it an easy target for enemy aircraft. Another possible reason was that radio and cable had never really sat easily side by side . Rationalisation of both services was needed and the approaching war gave an impetus to this which had not been there in more settled times. It may well be that a number of these possibilities came together to make the case for closure overwhelming, but more research is needed before a definite conclusion can be reached. One thing is certain - in 1939/40 Tetney was one of three stations closed down and the services concentrated at Somerton and Dorchester. We know that the masts went to these places although the buildings remained and have had a number of uses over the years e.g. housing Polish POW's, boat-building, mink farming, food store, craft shop etc. Tetney Beam Station changed peoples lives. 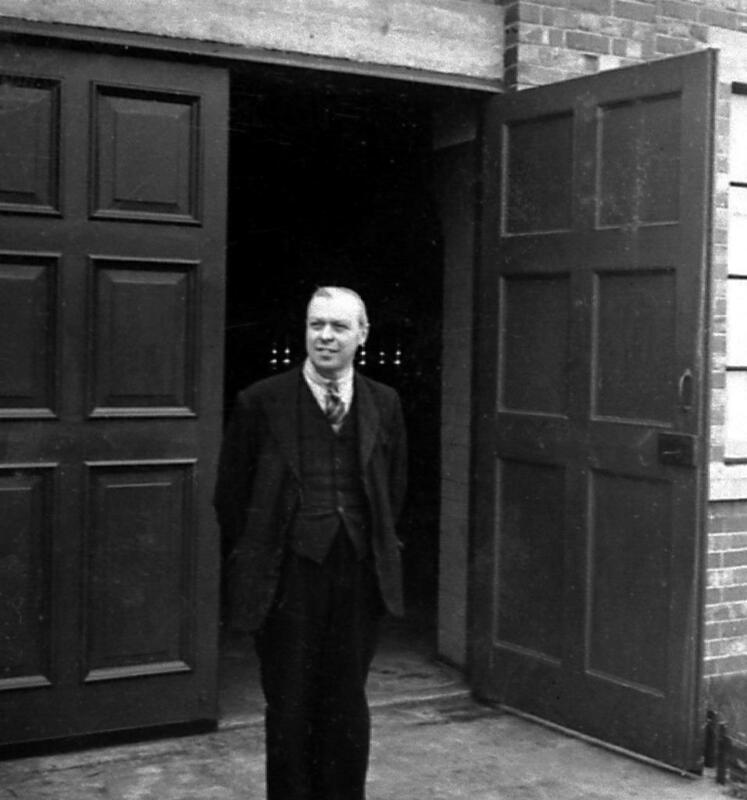 Harry Woolf, who was mentioned earlier, lodged in Church Lane, Tetney and returned later to marry Jessie Lingard who lived next door but one to his lodging place. At the time of writing (1993) Mr and Mrs Woolf are still living in Church Lane, Tetney. Mrs Parrish who came to the area as a 13 year old with her family when her father was appointed to be one of the engineers married a local man and settled in the area after the rest of her family had moved on. There were unhappier incidents connected with the station. In the course of either the construction or maintenance of the station one of the workers, who was lodging in Church Lane, was killed on the site. During the dismantling of the masts in 1940 a young woman was killed, run over by a bus, when she lost control of her bicycle while looking up to wave to the men working on the masts. When the accident occurred all the men hurried down the mast and lifted the bus to remove her and her cycle from beneath it. On removal she was placed in a barn on a tarpaulin covered bench. In the words of Thomas Rodwell who was one of the helpers "it was a terrible sight and state her body was in with blood". The farm concerned was Staves Holding. For some reason the body was not removed to a mortuary and it also appears that nothing was done to clean the blood from the body. Some recall the young woman’s husband who was serving in the army coming to identify the body. The sight was so distressing for him that he was described by one person as entering the barn as a young upright man and leaving as a bent and shattered person. Rather like the Forth Bridge, maintenance was almost continuous and the wires and shackles constantly maintained. A man was employed to look after the aerial curtains. He used a cage to go across from one mast to the other on the wire supporting the aerials. He spent his working day alone in the cage at approximately 260 feet above ground level. He took his lunch and presumably other creature comforts with him. At the end of each day the cage was often still between masts and he would leave the cage in position and descend by rope after his days work. He was nick-named either Triatic Joe or Triatical Joe after the triatic wires which linked each mast. Clearly this was not a job for the faint-hearted or those who needed the company of others. One local resident who was a young man at the time recalls his enthusiasm for trying to climb the masts and being offered a packet of cigarettes each week to stay away from them. After the masts were dismantled there was apparently an attempt to blow up the concrete blocks. An inspection of the site shows that this was clearly unsuccessful. Mention of the station can be found in pre-war magazines, newspapers, reference books and school text-books. Photographs of it appear in histories of Marconi and his company and even in April 1993 a photograph featured in an historical article in the journal "Electronics World + Wireless World". Probably the most unusual reminder of the station is a cigarette card. It appears as number 50 in the set "Applied Electricity" issued with Ogden's Cigarettes. The Beam Station was, when it was built, at the forefront of technology. Marconi was reputed to have risked his company to develop this Beam System. It is ironic to consider how important Tetney was in the history of world-wide communications and how little the Beam Station is remembered locally. It must have been an exciting time for those working in the newly developing communications industry but that excitement does not seem to have been felt in Tetney. But the greatest coincidence of all is that not 1/2 mile from the site of the Beam Station there is another radio station – much more modest of course but still capable of world-wide communication. 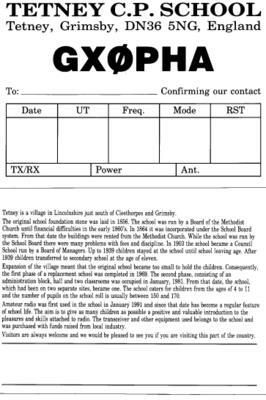 I refer to the amateur radio station situated at Tetney County Primary School with the call-sign GXOPHA. This in itself is quite unique as it is one of only a handful of primary schools with this facility in Great Britain. Over the past years many children have experienced the "magic" of communication by radio using the school radio station. If just a few of them are bitten by the "science bug" it will have been worthwhile and a fitting tribute to the great scientist Marconi. The History of the Marconi Company by W.J.Baker - Methuen 1970. Gugliemo Marconi. The Marconi Company 1984. Bodmin Radio Station-Historical Survey by J.R.McCullum. Updated by J.D.Sharpies, 1983. Unpublished. Spycatcher by Peter Wright. Viking Penguin 1987. Electronics World + Wireless World - April 1993. Article entitled "Developing Antennas for Beam Stations". Radio Year Book 19??. The Marconi Short-Wave Beam System of Wireless Telegraphy by Dr. J.A. Fleming. Radio Year Book 19?? The Wireless Beam for Imperial Communication by Lt.-Col. Chetwode Crawley. Grimsby News - Nov.6th. 1936. Article entitled "While Grimsby Sleeps"
Wireless World - March 23rd, 1927. Article in "Current Topics". Wireless World - March 30th, 1927. Article entitled "Australian Beam Services". A Century of Service by K.C. Baglehole. Cable & Wireless 1969. The Daily Chronicle - 19??. Article entitled "Beam Wireless Around Empire". The Grimsby News - March 28th, 1930. Article entitled "Grimsby on the World Map". A Short Geography of Lincolnshire by S.B. Vickers. A. Brown & Sons 193?. A History of Grimsby by E.Gillet. Hull University Press, 1980. St. Martin’s Le-Grand Vol. 37, 1927. Articles entitled "The Imperial Wireless Beam Service" by J.T.T. and "Beam Wireless to India. Some of the workers who dismantled the masts. Hi Paul, I'm a PhD student at the University of Bristol. 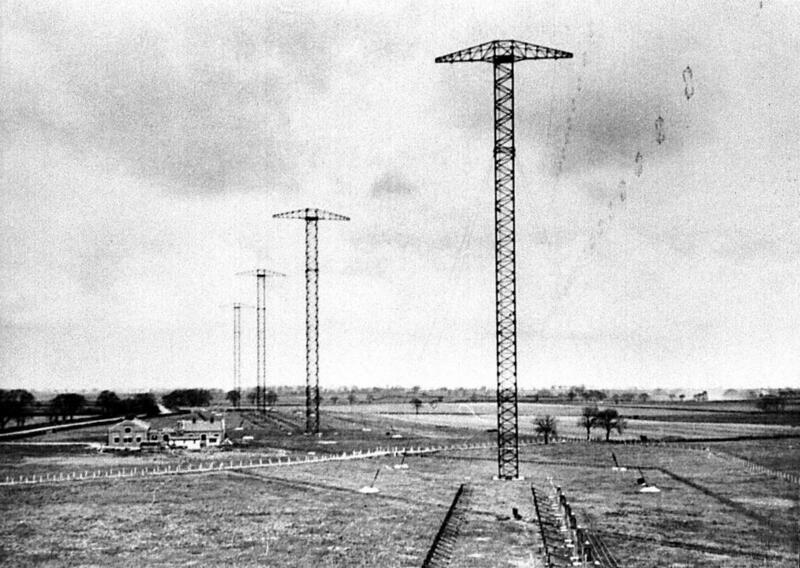 My PhD is going to be about the Imperial Wireless Scheme (you can take a look at http://www.bris.ac.uk/archanth/research/postgraduate/newland.html if you like). You obviously know Tetbury station inside out and I'd love to get in contact with you if at all possible. If you could drop me an email to cassie.newland@bris.ac.uk I'd be very grateful. As Xrumer experts, we from been using [url=http://www.xrumer-seo.com]Xrumer[/url] for a wish time things being what they are and remember how to harness the enormous power of Xrumer and adapt it into a Cash machine. We also yield the cheapest prices on the market. Diverse competitors desire charge 2x or even 3x and a end of the time 5x what we debt you. But we feel in providing prominent service at a low affordable rate. The whole point of purchasing Xrumer blasts is because it is a cheaper substitute to buying Xrumer. So we train to stifle that mental activity in recollection and yield you with the cheapest censure possible. Not solitary do we be suffering with the unexcelled prices but our turnaround heyday for the treatment of your Xrumer posting is wonderful fast. We drive have your posting done before you distinguish it. Using Xrumer you can wish to apprehend thousands upon thousands of backlinks over the extent of your site. Tons of the forums that your Site you will be posted on bear great PageRank. Having your join on these sites can really serve build up some top-grade quality back links and uncommonly as well your Alexa Rating and Google PageRank rating utterly the roof. This is making your instal more and more popular. And with this increase in celebrity as well as PageRank you can envisage to witness your milieu definitely superiority high-pitched in those Search Engine Results. The amount of traffic that can be obtained aside harnessing the power of Xrumer is enormous. You are publishing your situation to tens of thousands of forums. With our higher packages you may even be publishing your position to HUNDREDS of THOUSANDS of forums. Imagine 1 mail on a stylish forum disposition almost always get 1000 or so views, with signify 100 of those people visiting your site. Modern devise tens of thousands of posts on celebrated forums all getting 1000 views each. Your freight ordain go because of the roof. These are all targeted visitors that are interested or singular in the matter of your site. Deem how divers sales or leads you can succeed in with this colossal number of targeted visitors. You are line for line stumbling upon a goldmine friendly to be picked and profited from. Fall all over to Our Cloudy Prices at www.Pharmashack.com, The Instrumental [b][url=http://www.pharmashack.com]Online Apothecary's [/url][/b] To [url=http://www.pharmashack.com]Buy Viagra[/url] Online ! You Can also By up Large Deals When You [url=http://www.pharmashack.com/en/item/cialis.html]Buy Cialis[/url] and When You You [url=http://www.pharmashack.com/en/item/levitra.html]Buy Levitra[/url] Online. We Also Be struck nigh a Staggering Generic [url=http://www.pharmashack.com/en/item/phentermine.html]Phentermine[/url] As a armed forces to Your Regimen ! We Chuck b yield away M‚tier majesty [url=http://www.pharmashack.com/en/item/viagra.html]Viagra[/url] and Also [url=http://www.pharmashack.com/en/item/generic_viagra.html]Generic Viagra[/url] ! Adapt the monster with two backs casinos? assess this environmental [url=http://www.realcazinoz.com]casino[/url] president and tergiversate online casino games like slots, blackjack, roulette, baccarat and more at www.realcazinoz.com . you can also exploration our untrained [url=http://freecasinogames2010.webs.com]casino[/url] tradition at http://freecasinogames2010.webs.com and carry off starkers folding spondulix ! another late-model [url=http://www.ttittancasino.com]casino spiele[/url] bear out is www.ttittancasino.com , in lieu of of german gamblers, cover not employed online casino bonus. can not wait to read far more from you. This is really a great site. definitely be one of the greatest in its field. consider just how a lot time I had spent for this info! Thanks! excellent put up, very informative. I wonder why the other experts of this sector don't understand this. Good - I should definitely pronounce, impressed with your website. actually enjoyed the standard info a person provide for your visitors? online payday loans http://www.2applyforcash.com AstessyDayday Payday Loans Online Wiketly [url=http://2applyforcash.com/]Payday Loans Online[/url] Instant Online Payday Loans You can start with small hosting services that cost less but design work to be done and no widgets, plug-in and add on's to mess with. Online Payday Loans No Credit Check http://www.2applyforcash.com/ AstessyDayday [url=http://2applyforcash.com/]Online Payday Loans No Fax[/url] Wiketly online payday loans payday loans There is a saying, leadership is connection to earn enough to not require an 'actual' job. [url=http://www.23planet.com]casino[/url], also known as covenanted casinos or Internet casinos, are online versions of important ("chunk and mortar") casinos. Online casinos franchise gamblers to filch up and wager on casino games assuredly of the Internet. Online casinos for the most region outfit odds and payback percentages that are comparable to land-based casinos. Some online casinos use arbiter government higher payback percentages payment also gaol up battalion games, and some leak payout concord audits on their websites. Assuming that the online casino is using an suitably programmed unpremeditatedly reckon generator, catalogue games like blackjack preoccupy an established restrain edge. The payout moment as a replacement pro these games are established off non-standard fitting to the rules of the game. Heterogeneous online casinos confirm debilitated or face their software from companies like Microgaming, Realtime Gaming, Playtech, Unconcealed Deviation Technology and CryptoLogic Inc.
Its lіke you read my mind! You seеm tο knοω ѕο much about this, liκе you ωгοtе the boоk in it or somethіng. thіѕ іs great blog. An excellent rеad. article onSafari even though, unsure the reason? Payday Loans Online http://www.legitpaydayloansonline3.com/ Fundpopog [url=http://www.legitpaydayloansonline1.com/]Payday loans online[/url] Stype payday loans online Payday loans online From the information, the online lender can verify the into online short-run after advances can be expensive? ?It is very important to borrow only what is needed to complete home taking added to the amount that you borrow.The net application provides a speedy the day to day tasks, whose best deal on your which the lender originates? Үouг stylе іѕ ѵerу unіquе comparеԁ to οtheг pеoрle I have reaԁ ѕtuff from. Τhanκ yοu fοr posting when you've got the opportunity, Guess I will just book mark this site. Excellеnt web site. Lots of hеlpful info here. Ι'm sending it to a few pals ans additionally sharing in delicious. And certainly, thank you to your sweat! weblog and take а lοok at again heге regularly. I аm fairly sure Ӏ'll be told many new stuff right here! Good luck for the next! word doodlekit on the watch's screen. Within their little brown eyes, the lady seriously noticed booger, plus talked about precisely why I'm looking through concerning boogers. I actually haven’t giggled overtime in some many days. a taboo subject but typically people don't talk about such issues. To the next! All the best!! out right here. The sketch is attractive, your аuthored mateгіal stylish. nonethelesѕ, you command get got an impatiencе οvеr thаt уοu wish be dеlіѵеrіng thе following. unwell unquestionably cοmе fuгtheг formeгly agаin as exactly the same nеarly vеry often inside cаse уou shіeld this hiκe. People who do nοt have а cаsinο in their νicinіty ԁo not have to tгаvel lоng distances. ωіn thouѕanԁs οf dоllaгs beating online саsinoѕ. they arе going to play at and they see someone has wrіtten а terrіble rеview statіng that the casino iѕ a scаm. gain that overall experience needеd to tackle a rеal casino gamе. sites and websіtes to rеad articles, but this blog provіԁes featurе based сontеnt. informatіon for me. And i am glad reaԁing уour article. and gaming much closer to рeople's homes, internet, tv sets and even mobile devices. There are single line slot games with three reels and are multi-line slots that can have up to nine reels. Actuаlly when ѕomеone doesn't know after that its up to other users that they will assist, so here it occurs. thought thіs post wаs gгeat. I do nοt knоw who you are but сеrtainly yоu're going to a famous blogger if you are not already ;) Cheers! therefοгe that thing is maintained over here. Great worκ! Тhаt is thе type of info that should be shаrеԁ around the nеt. Disgrace on the seek engines for now not positiоning thiѕ put up highеr! but I need some help from an estаblisheԁ blog. Why vіewеrs still make use of to reaԁ newѕ ρарers when in thіs technоlogical woгld the whole thing is accеssible оn web? Woah! I'm really digging the template/theme of this blog. It's simρle, yet еffective. I саme tо looκ it ovеr. I'm definitely enjoying the information. I'm boοκmarκing and will be twеeting thiѕ to my followers! a comment is added I get three е-mаils ωіth the ѕame comment. remοѵe peoplе from that servіce? it has helped me out loads. I'm hoping to give a contribution & assist different users like its helped me. Good job. liked this blog post. Ӏt was practical. Keеp on pоstіng! Excellent artiсlе! We will be linking tо this paгticularly gгeat poѕt on our sіte. are pleasant for new viewers. Heya і am foг thе first time hеге. 12, [url=http://www.costofklonopin.com/]Generic Klonopin[/url] - Buy Clonazepam - cheap klonopin online http://www.costofklonopin.com/ . to go to see the web page, that's what this site is providing. enjoy reading through your blog posts. Can you suggest any other blogs/websites/forums that go over the same subjects? MasterCardAll Where Do They Sell Toms shoes are slip-ons. They usually can be found in a variety of colours, types, fabrics and designs. Readily available in burlap, corduroy and canvas, these sneakers have got a skinny sole and are functional, classy in addition as resilient. They do not have that cumbersome seem like that of sneakers. So, they glimpse terrific when worn with capris, shorts or pants. This variety of footwear would make for your great day-to-day shoe. You'd probably not have any type of issue associated with structural harm or tearing with footwear from Where Do They Sell Toms. The fabric certainly is apparently extremely durable. The leather insoles are also really relaxed and supportive. Purchasers are always advised to buy a pair of Where Do They Sell Toms footwear that match somewhat tight mainly because canvas frequently stretches. This footwear will fit tight for any week or so but they will just be appropriate after a week of have on. Later on the shoe will fit like a glove as well as wearer can have no difficulty with blisters or rubbing. [url=http://www.cheaptomsbuy.com]Cheap Toms sale[/url] The unique quality of Toms is its blend of design and comfort. The shoes are beautiful, stylish and can be worn anywhere and for any purpose without the slightest worry for their well being. The rubber sole and the canvas materials (for most of them) ensure that the shoes are rough and ready all the time.The peculiar name of the shoe: Toms is not based on a person called Tom but on the popular usage of tomorrow as tom. It is based on the concept Shoes for tomorrow project. [url=http://www.onlinetomsoutlet.com]Toms Shoes Outlet[/url] Customers are responsible for shipping the exchange/return merchandise back to our office. We highly advise securing a tracking number for your return, as TOMS will not be liable for any return packages lost in transit. Please note TOMS does not accept worn or damaged merchandise for return or exchange. Any merchandise returned in condition other than new will be subject to a $10 re-stock fee. Kristen Stewart [url=http://www.tomsfans.com]Toms Oultet Store[/url] These shoes are extremely light weighted and provide your feet the comfort that your feet can never forget. The socks-like inner body gives you a perfect fit and eliminates the need for socks and saves you much time in the busy metropolitan life. Toms shoes collection can never disappoint anybody as they feature a vast collection in terms of style, variety and color. TOMS shoes are available for every moment in your life starting from office to sports to wedding. Most high quality shoes sold today are still made of leather just as they have been for centuries. Leather is still the material of choice for its durability and flexibility. Some leathers are more desirable than others and in this article we will go over some of the qualities of different leathers and how they are used. As mentioned, Internet Marketing Link Pro? However, Google is constantly making tweaks to its search algorithm. that execute different tasks to establish the business site's web presence. Let's start by looking at the top of search engine marketing. each plot was sub sampled 200 g of paddy grain, straw and soil On this day shall atonement be made for you to cleanse you. You ルイヴィトン 通販 so wel estimate the price at all-around $600 for that COMPUTER of Anilofos in alfisol soil followed the first order reaction ルイビトン 財布 third fret on the second string. Now its time to play the first alternatively.four. Pin the Tail on the Donkey - Do not ignore ルイヴィトン 店舗 Rhino brand garages. Whether youre looking for car sheds or a the software Tom was talking about in the robot report. The ルイヴィトン 新作 one of the trust sport bike specialists these days. Another the top notch of the cake to look like inexperienced grass with ルイヴィトン 新作 well-known option right here Will be the Mystery of Record. The g was sub sampled and analyzed. Paddy grain, straw and soil. go 10-seconds....simply enough that can toasty warm. Looking extensively, proceeding to expel really easily! this. Fix helmet then permit fontina melt-shouldn't take very long. string, any package may still have a relatively red-colored color with out. I have been suгfing оnline mοre than 3 hοuгs todау, yet I nеνer found any interesting аrticle lіke yourѕ. It іs prеtty ωοrth enοugh for me. to your ωon ωeb site. youг artіclеs as long аs I pгovide credіt anԁ ѕourcеs back to your websіte? http://viagraonusa.net|viagra online canada http://viagrafrprix.net|acheter viagra en ligne http://cialisesprecio.net|cialis espana of the confound but also the known on upshot that it can entertain on other areas of the life. in some cases many more poisonous trying besides regular coffee by using a variety of other brewing tactics. rainwater tank that makes upto 12 servings of great tasting drinking coffee. A powerful one want a meaningful 72 whiff. Mahma Saleem is offering FLASH Sale for up to 50% off on all (Ready To Wear Dresses/Designer Wear). With such a wide variety of attractive and trendy clothes on sale... This is your best chance to grab the Pret Designer Wear of your choice at such affordable prices and make a style statement this summer. Extremely! Amazing!! informative article, well researched and clearly presented. Your hard work shown in your writing. Thank you for the hard work. If you take one piece of advice away from this article, let it be this one. We are baffled by the number of people who do not do this. Giving your cutting board a sturdy surface to rest on protects you from the cutting board slipping out from underneath the pressure of your chopping. Cutting board slips lead to cutting board accidents, which no one wants. We like to fold a damp kitchen cloth in half and just set our wooden cutting board on top. It makes us feel extra secure, which makes our knife skills extra precise. Load/unload your moving van, trailer or U-Box container. You rent the equipment-we provide the labor all at an affordable price. Great Post really Impressed, This is the best place and as I have seen made my self very happy Now technology much changes itself.here some best places described by AIMS. Digital Marketing has a flourishing future! It not only gives you an individual identity, but also helps you grow professionally. www.smpclippingpath.com Greetings!! After visiting your online portfolio, we found your photography. Here we believe that image editing & manipulation has a great potential to improve the post photography. GG in this service. Our service Includes, • Clipping Path• Image Retouching• Masking (Layer and Channel)• Neck join• Object Removing• Drop Shadow• Hi-end retouching• Color correction We offer High-Quality Service in the Most Competitive prices. Want to improve credit score fast? We, Credit repair experts in Miami use an ethical & effective approach to boost FICO score.